An appeal for volunteers to oversee the road closure for this year’s Day of Dance has been issued. The annual celebration is planned for Saturday 27 April 2019 but can only proceed with the main road through the village closed to ensure public safety. Volunteers are needed to marshal the road closure, with each person asked to give just an hour of their time. A road closure was introduced back in 2010 after the Day of Dance began to become hijacked by teenagers who travelled to the village to indulge in underage drinking, leading to unruly behaviour. 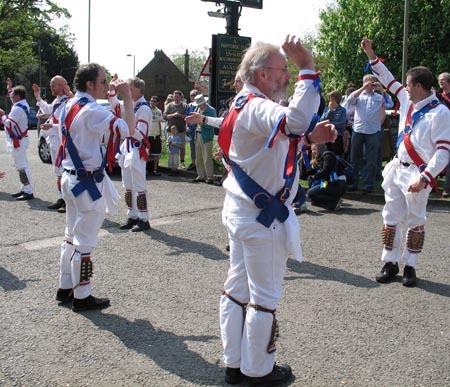 Restricting access between the Oxford Road and Church Lane was one of the measures introduced by a working group who sought to return the focus of the Day of Dance to a celebration of Morris dancing. This year the Morris teams will celebrate 44 years of performing the Adderbury dances since the revival began back in 1975. The village boasts two male teams, Adderbury Morris Men and Adderbury Village Morris Men, and a ladies team, Sharpe and Blunt. They will spend the day performing the Adderbury dances that were documented and preserved by the one time resident of the village Janet Blunt. A blue plaque commemorating Ms Blunt can be found outside Le Hall Place in Manor Road. It was from Ms Blunt’s manuscripts the 1975 revivalist dancers bought Morris Dancing back to Adderbury. Volunteers are needed to oversee the road closure for this year’s event between 11am and 6pm. Anyone able to help should email the Adderbury Parish Council Clerk, Theresa Goss, at: adderburypc@hotmail.com.